I love making these little activity trees (see my original Activity Tree and my Fall Activity Tree) with JaiseAnn. They are not the best looking--but they are toddler friendly and they help us keep track of the things we want to accomplish each season. 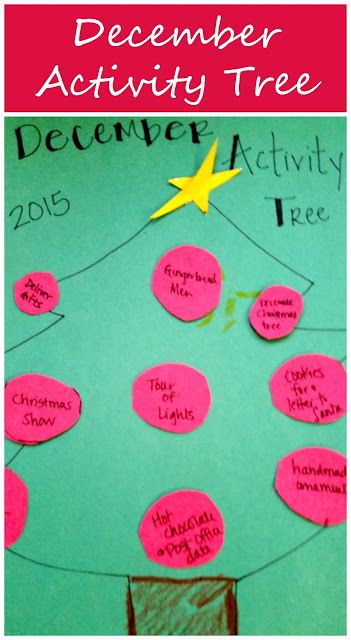 We make a tree that fits the season and find a way to decorate the tree with all the activities we want to do. This month we made a Christmas tree and put our top activities on red ornaments. JaiseAnn helped me "hang" the ornaments on the tree and then we put our tree up on the fridge. *Decorate our Christmas tree and watch A Muppet Christmas Carol. Our Christmas will be simple but it will be filled with traditions and so many memories I will cherish. I wrote out this list and nearly started crying. I am so grateful for the opportunity I have to be JaiseAnn's mom and to experience this holiday season with her. I am so looking forward to it. What are your "bucket list" activities for December?